We think we can make out a farmhouse. Or maybe it's a dinosaur. We don't know much about whatever project is in the works at Respawn Entertainment - the new studio formed from the core of Call of Duty creators Infinity Ward after the little kerfuffle that saw founders Vince Zampella and Jason West ousted. We do know that one of the artists worked on Monkey Island and the Star Wars prequels, and we have heard that it's a sci-fi shooter that will compete with the likes of Halo and Gears of War, but other than that? Nada. 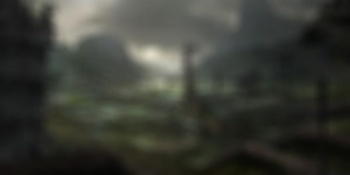 Respawn launched its full brand-new website today, and to celebrate, it released out a teaser image related to its brand-new, super-secret game. Unfortunately, as you can see here (or in a higher resolution here), said image is also heavily blurred, making it nigh-impossible to decipher. The sky looks stormy, and there's a (dilapidated?) building on the left side of the screen, but other than that I haven't a clue what's in here. I want to say the structure in the middle right is a barn or farm storage house replete with chimney/smokestack, but it could be a factory. Or maybe that giant chimney-looking-thing is actually the neck of a dinosaur. This picture gives more questions than answers, but personally? I'm rooting for the dinosaur.